If you have a cat, you've seen it happen. You're sitting quietly in the house, probably doing an activity like reading, watching television, or some other innocuous pastime when suddenly your cat goes on high alert. She's staring very intently at a space in the room that to your eyes is completely vacant. She starts following something with her eyes, watching it move about the room, giving it her undivided attention ...but you still see nothing there!! Then just as suddenly she blinks.. loses all interest, and goes back to giving herself a good washing as if nothing ever happened. You've seen it, right? Well I have the answer to this perplexing situation...Cat fairies! 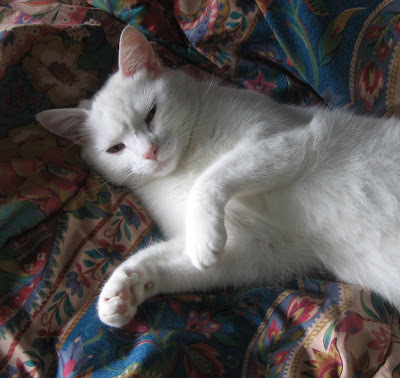 It's well known that cats are more then a little fey so it just seems natural that they would have fairy friends. 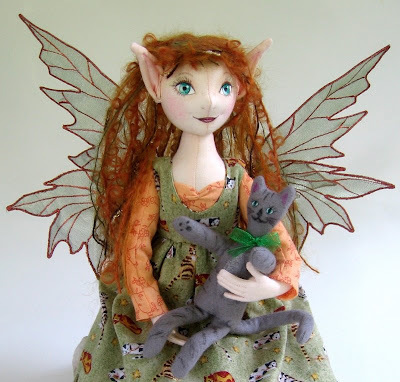 These fairies act as guardians for cats, watching over them, telling them secrets, and incidentally helping them to attain the reputation for having 9 lives. And here is one of the four kitties she guards at my house, Calliope, who obviously thinks I'm insane to be taking her picture when she's trying to take a sun nap! Now it makes sense! I always though my cats were nuts! Cat fairies! Thanks for the insight! Ok. Thanks for clearing up the cat behavior. I always wondered about that. By the way, these pictures are adorable. Your work is astoundingly beautiful! Thanks for sharing this secret, I suspected just as much with our 2 kitties, but now I'm certain! So my cats aren't trying to psych me out? It's fairies? I should have known! Nice picture of Calliope as well! Oh how cute! 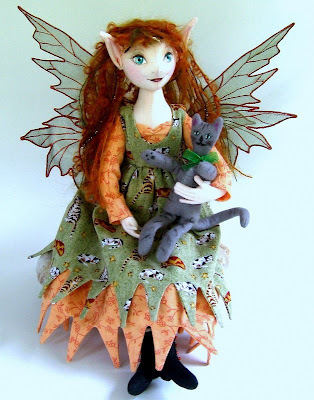 The fairy is adorable and I love your cats pose! Cute! So THATS what they're looking at!? Whew, Im glad you cleared that up. Mine like to walk accoss a room, freeze, then look wild eyed into a darkened hallway or closet. Freaks me out! I feel much better knowing it's a fairy.